Conductor, violinist and composer Paul S. Kim has been music director of the Orchestra of the Eastern Shore since 2014. An assistant professor of music at Old Dominion University, Kim directs the ODU Symphony Orchestra, teaches conducting and violin, and oversees the string and chamber music programs. He also serves as symphony orchestra conductor of the Fine Arts Camps Europe/Czech Music Camp for Youth. 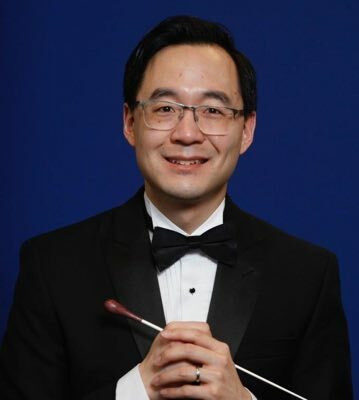 Kim was previously assistant conductor of the Richmond Philharmonic and the Piedmont Symphony Orchestra, and he has led performances with the Virginia Symphony, Roanoke Symphony, Waynesboro Symphony, and university orchestras across the U.S. and in China. He was also a conductor for Eurythmics star Dave Stewart and his Rock Fabulous Orchestra, conducting songs Stewart wrote for Eurythmics, Bono, Gwen Stefani, Tom Petty, Mick Jagger, and others. A scholar of the music of Carl Roskott, Kim is the conductor and producer for a recording album Carl Roskott: Works for Violin, which was released under the Centaur Records label in May 2018. Kim is the composer of nearly thirty original works. Where Darkness Meets Light, a multimedia composition for violin and cello in collaboration with artist Hannah Kirkpatrick, was performed at the Chrysler Museum of Art and at the 2017 Glass Art Society Conference to critical acclaim, and a digital album of the music was released in August 2018 on iTunes, Amazon, and CD Baby. Kim’s arrangements of Radiohead songs for string quintet SYBARITE5 have been performed on NPR’s Performance Today as well as at Carnegie Hall, Lincoln Center, and Aspen Music Festival; one such cover helped earn SYBARITE5 a top-ten rating in Billboard’s Classical Crossover Albums chart in 2011. The arrangements have been released on SYBARITE5’s album Everything in Its Right Place. As a violinist, Dr. Kim is a member of the Roanoke Symphony Orchestra and has performed with the Virginia Symphony and Maryland Symphony as well as internationally. He and his wife Rebecca are co-founders of New Music Norfolk, performing and promoting new art music for Norfolk and surrounding communities. Dr. Kim completed a D.M.A. in conducting performance at Shenandoah Conservatory. Previously, he earned an M.M. in orchestral conducting at the University of Maryland as well as an M.A. in music and a B.S. in chemistry at the University of Virginia. Primary conducting mentors were Jan Wagner, James Ross, and Carl Roskott. Kim also served as a sergeant in the United States Marine Corps Reserve. © Copyright 2005-2017 Orchestra of the Eastern Shore. All rights reserved.